Help them have a monster of a time at your child's next birthday when you shop the Monster High Party Supplies from Birthday Express! Whether you're looking for fun party favors to make the party last even after day's over, tableware to make the big meal perfect, or anything else, you'll have your pick, adorned with classic Monster High characters. Have a ghoul who can’t wait to attend Monster High? Then make her birthday a class project with Monster High party decorations from Birthday Express. We have all the things you need for a horrific party including plates, napkins, banners, balloons, table covers and costumes. Each piece is adorned with some of the school's most popular students, so your child can bring their art to life with Frankie Stein pencils, drink punch – minus the blood, of course – from Draculaura cups, or transform without the moonlight with a Clawdeen Wolf costume. However your child wants to celebrate her birthday at Monster High, make sure to extend the school day a little longer and give her all the extra cringing credit she deserves. Score an A+ on your party-planning course with the Monster High Party in a Box set. This set includes everything you’ll need for a successful birthday school day, including plates, cups, napkins and thank-you notes. It's everything you need to show the class a frighteningly good time before the school bell tolls and they have to head home. Want to recreate the creepy feel of Monster High for your students? Bring the classroom to your party event. Situate seating places in a circular pattern like desks in a classroom and assign seats based on the children’s favorite Monster High characters or their favorite type: zombies, vampires, werewolves, etc. Calling all ghouls and mansters to your child’s party is a snap with these Monster High-themed invitations from Birthday Express. Each set includes everything you need to invite eight of the most shockingly awesome monsters ever discovered to the birthday event of an unlifetime. A teacher who doesn’t decorate her classroom is a horrifying idea, so before the ghouls and mansters arrive to celebrate your child’s special day, make sure the classroom is dressed to impress with decorations from Birthday Express. Spook up the lunch room table with a Monster High paper table cover, fill the classroom’s corners with balloons and make sure to keep plenty of Monster High napkins on hand—it can be hard to drink with fangs after all. A banner is a great way to highlight the ghoul of the day and let everyone know recess is now in session. You don’t have to be the spirit student Kiyomi Haunterly to float through the party; you just need to add the right balloons. Birthday Express’s Monster High Balloon Bouquet Set features nine balloons, including two Monster High character balloons and a Skullette Badge. The kit also includes ribbon and a balloon weight perfect for keeping your balloons or Kiyomi from floating away. These mansters and ghouls may eat with their claws most of the time, but at your table, it’s time for some manners. 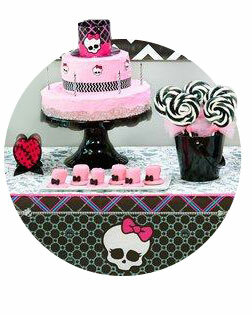 Monster High tableware offerings are a great way to keep the theme of your party going while abolishing some of the more beastly behaviors. We have everything your table needs, including fang-proof cups, napkins and plates and plastic ware that can be held by any hand or claw. Set it all on top of our Monster High Paper Table Cover and decorate the space with our Monster High Table Decorating Kit; you’ll have a look that could raise the dead to your party – provided they’re invited of course. What’s on the lesson plan for your Monster High students today? Is it math, old world history or maybe a class in Transylvanian? Activities are an essential part of any party, and if you’re feeling like your party ideas could use a little resurrection, we have all the inspiration you need here at Birthday Express. Invite your ghouls and mansters to step into the dark to find the treats inside with our piñata kit, dress up as their favorite Monster High student with our costume options or have their photo taken in front of our wall-decorating kit. Just don’t be surprised when Draculaura’s image doesn’t appear. Whether you use it as an welcome sign or a backdrop for the perfect class photo, the Monster High Banner will certainly add to the setting of the party. If your child wants to release their inner monster in a fun, safe way, Birthday Express has all the costumes you need. We have the gear to recreate any look, from Frankie Stein and Lagoona Blue to Skelita Calaveras and Honey Swamp. That's everything you need to ensure your child’s favorite monster doesn’t miss a day of class. All school days have to come to an end, and when your ghoul’s event is over, don’t forget to show her classmates how much their attendance meant to you and your daughter. No little monster can resist Birthday Express’s filled favor boxes, and lip gloss is the perfect gift for monsters who want their lips to be just as shiny as their fangs. And for the monster moms who want to leave nothing to chance, Birthday Express’s Mega Value Favor Pack Rock is the perfect party gift for any group of students. You’ll ensure everyone had a fun, memorable time and they’ll be twice as excited to return when it’s time to call the next class into session. Introduce a little glitter to your monster’s grin with these lip gloss favor gifts. Non-vampires will love how this gloss makes their lips sparkle in the sunshine and it is available in blue, pink or purple, the perfect match for any monster’s lip tone.This is some text. In order to create your set of gift bags when the party ends, you will want the Monster High Loot Bags. Designed with your favorite characters from the show, your loot bags will blend in perfectly at the event.